The careers programme at Bucks UTC is developed in partnership with our employer sponsors and partners. Bucks UTC has a well-established vocational curriculum which is the most distinctive and successful feature of our provision and the reason students should chose to join us. In keeping with the vision, mission and ethos of Bucks UTC, all students engage with employers through their chosen specialism. We have strong links with national companies, as well as with businesses and charities locally, providing our students with access to a wide range of work-related learning opportunities. “Leaders’ sharp focus on the world of work means that students learn quickly about the importance of professional appearance and behaviour. Speakers from local and national businesses give regular presentations to students on expectations and opportunities in the workplace. Consequently, the majority of students are self- confident, mature young adults who are ambitious for their own futures. 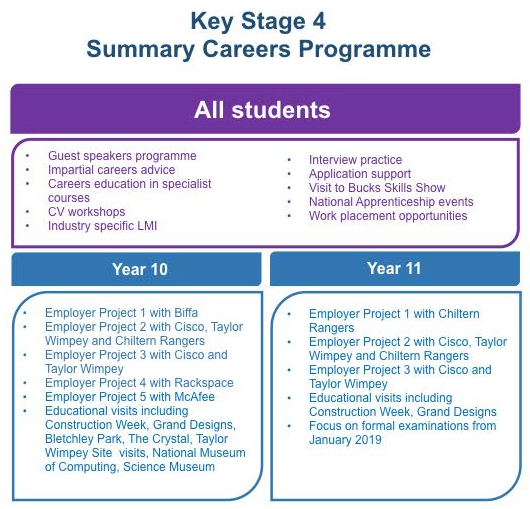 Students have access to a rich and varied programme of study that includes well-designed work placements, input from national and local businesses and the opportunity to study for well-regarded specialist qualifications in construction or computing. Leaders work productively with partner businesses to ensure that students can access appropriate work placements. In addition, representatives from local and national computing and construction businesses visit the UTC to give students invaluable insights into the world of work. We are pleased to be part of the new Careers Hub with 20 other local schools with Buckinghamshire Thames Valley LEP. 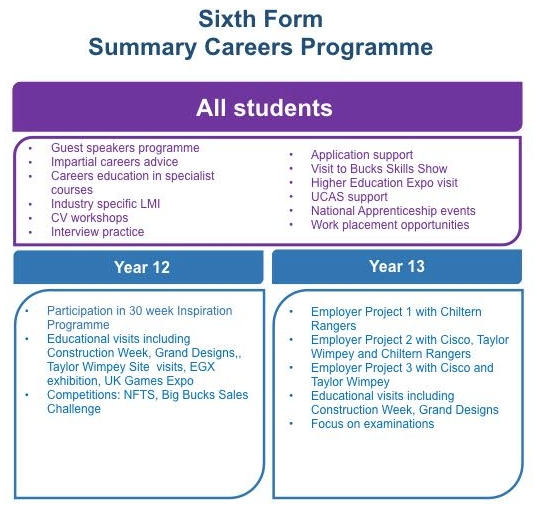 Our focus in 2018/19 is to continue with the great work in our sixth form and further develop our careers work with year 10/11. Destination data is reviewed annually. We are proud of our students and that the UTC has zero NEETS. This enables the UTC to understand our students’ career paths and shape the careers programme and curriculum going forward with our employer sponsors and partners.